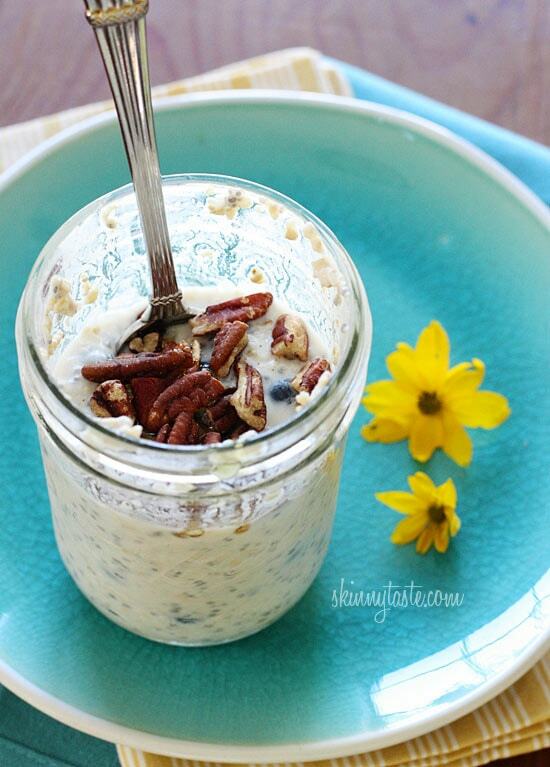 Overnight oats in a mason jar (no cooking required)! A hearty healthy breakfast packed with fiber, vitamins, and nutrients. Now that the weather is warm, almost every weekday morning after the gym my breakfast routine is either these overnight oats, avocado toast, hard boiled eggs, a green smoothie or a bowl of berries, topped with some crunchy granola, nuts and chia seeds with a little almond milk. Overnight Oats is very popular, some people add Greek yogurt to their oats for more protein, but personally I’m not a fan of the tangy taste of yogurt in my oatmeal. Since granola is basically toasted oats, I decided to take my favorite morning combination using oats instead of granola and place them in a jar overnight to see how they taste the next day! Verdict: after removing the jar from my refrigerator this morning, I let is sit on the counter while I went to the gym to get the chill out of it. Oatmeal was on my mind all morning as I ran on the treadmill and when I got back I was excited to have breakfast right there on my counter waiting for me and I enjoyed every last spoonful! Yum! True story: My younger brother had very high cholesterol (he’s thin) in his 30’s and was able to lower it by over 100 points without the help of any medication, just buy eating raw oats every morning for about 6 months and getting regular exercise. He also increased some healthy oils, but he swears by the oatmeal. The doctor was amazed because they wanted to put him on Lipitor, but my brother insisted on trying to lower it with diet first to see if he could. Oatmeal has since been a part of his daily breakfast routine. p.s.- I was never a fan of the taste of Stevia until I tried the liquid drops from NuNaturals. Stevia lovers always told me good things about NuNaturals so when I finally got to try it, I see why. You don’t get that bitter aftertaste you get with other brands on the market. You can find it at Whole Foods or online, but if Stevia isn’t for you, use whatever you prefer in your home, a little brown sugar or maple syrup would also work, or you can leave the sweetener out completely. Enjoy!! Place all the ingredient in a jar, shake, cover and refrigerate overnight. The next morning, add your favorite crunchy toppings such as nuts, granola, etc and enjoy! Wow! Love how easy and delicious this was. Could I put frozen fruit in? I’m not sure if it would water down anything by morning. I freeze a lot of my berries before they go bad. Could be a great way to use them.Thank you!!! Doesn’t putting the banana in at night make them (and the oatmeal) gummy/slimy and kinda gross? I just add sliced banana in the AM after I warm it up. I also make mine with chopped up dried fruit, and of course crunchy granola on top. I’ve also made overnight oatmeal with steel cut and it was fine. Not a fan of blueberries in it. They’re bitter to me and the texture (for me) is so gross. I have a thing with food textures. How many ml should the jar be of? I really want to make these but don’t have chia seeds. Is there an alternative? If I omit them, with the texture be off? Thanks!! does the calorie count the adding in of the pecan topping? if so how much? Two 30 second bursts in the microwave. Love this recipe! Such an easy way to meal prep breakfasts for at work. Thank you! I loved this with the exception of the stevia, left a bad aftertaste. I will make it again, omitting the stevia extract and use a sprinkle of cinnamon sugar or no sweetener. I’m thinking the bananas and blueberries will probably add enough sweetness. The consistency of the oatmeal was PERFECT! Exactly how I like it! I make these all the time. Can you use old fashioned oats instead of the quick oats? I just love these in the morning. I never know what to eat for breakfast, but this fits the bill very well. I will give yours a try. It was delicious! I did not have the Chia but made it with balance of ingredients. Definitely easy and a quick breakfast. Can someone explain the plus sign involved after the points? It is listed as 5 points but then there is a plus 6. So, is this 11 points? Where does the plus six come in? Thanks so much for any response. I loved this recipe and want to continue with it. Points plus is an older version of a WW plan. I was pleasantly surprised at how much I liked this. Thanks! I appreciate all you do! 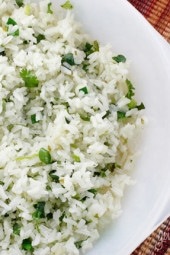 This is my go-to recipe site, love it!! Gina, I have a similar cholesterol situation. How much oats did your brother eat each morning? I am petite but usually consume 1/2 c of raw oats oats. I do watch points as I am a ww lifetime, so I usually leave the chia out…may rethink that though! ? Thanks for the great recipes every week! On the overnight oatmeal, what can I substitute for the chia seeds? You could use flaxseed instead but you don’t need to sub them for anything unless you want to. They add omega 3s (flax would too) but you won’t notice a big change in flavor if you leave them out. And for commenters above who arent crazy about bananas/blueberries, you could easily replace with another fruit like strawberries or raspberries or even raisins (though I’m not sure how that affects nutritional value). Great recipe, Gina! These are so good. I don’t like blueberries, so I just used more banana. I warmed them up for a minute in the microwave this morning and added 1t mini chocolate chips and 1t walnuts. It was like hot banana bread—yummy!! What can I substitute for banana? I hate them! Yes, I would leave it out and sub a different fruit. Do you use the vanilla premier protein shake? it was awesome and so easy! Omg!!!! So darn great!!! Thank you so much! A joy to eat! I used 1/2 banana and no chia. I brought it with me to work and it was amazing. Thank you!! Can we substitute coconut milk for almond milk?? I was skeptical. Cold oats? This was incredibly delicious! I took the suggestion of letting it go to room temperature, but thinking it would not have mattered as the flavors made it taste like dessert. My new make ahead go-to. Thanks!!! Can this be warmed in the microwave? Thank you for this recipe, I just put a jar in my fridge! Is there a substitute I may use for the chia seeds as I do not have that ingredient on hand. Many thanks! Why chia seeds? Can I sub flaxseed, which I already have around the house? How do the flavors differ? Do the chia seeds thicken it up? I would also love to know what the chia seeds are for – I’m not a huge fan of their texture. Gina? They just provide extra nutrients, you can leave them out if you’d like. Can you use regular rolled oats not quick cooking?? Delicious idea! However, I calculated the calories for all ingredients and got 342 calories, not 243. Can you use water, or have you tried, I don’t have any milk in fridge? I have had these for the past 3 mornings. Fixed the recipe to a tee, using a tiny bit of stevia as my sweetener. These are amazing! Tonight I added pumpkin spice instead of regular cinnamon and am excited to try. I too am trying to lower my cholesterol and this helps me stay full and healthy throughout the day. Thanks so much for the recipe!! Mine actually came out to 4 freestyle points, this is so delicious tastes like desert ? I’ve been making it for hubby & myself almost every night. I use reg. oats, 1/2% milk & water, stevia, & cinn. He’s up at 4:30 so he can pop it in micro. and he’s good to go. He likes it plain, I like the fruit & nuts. It’s very filling, easy if it’s prepared overnight, and very satisfying. I prefer the reg. oat over quick oats, can’t get into the Irish steel cut oats. Maybe one day…. This recipe is great! Satisfying and feels like dessert, much prefer over warm oatmeal. I don’t use stevia, instead use 4-5 drops of vanilla extract and then leave out the nuts and put 1 1/4 tsp maple syrup. Keeps it at 5 points but sweetens it so tastes like a treat. I make it at night for the next 2 days and keeps fine, longer than that it starts to be too mushy. I also use 1/2 banana and skim milk which I prefer. It is 5 freestyle points, 2 for the oats, 1 for the chia, 1 for the skim milk, and 1 for the maple syrup. Thanks for another tasty recipe, I’m finally enjoying cooking healthy, the WW recipes just weren’t up my ally. Thank you for your comments on not using stevia I’m allergic and was looking for a replacement! I made this last night for my sister and me, we both loved it. I forgot about the nuts, so it knocked off a point. Will definitely be making it more often. Afte reading all the comments I think I would like to try it with Fage one time and with the rolled Rhy another time, and maybe some protein power another time. I’m all set. Oh, and cherries must try that too!! Thank you, Gina, for the recipe. Absolutely fantastic! I’ve been making these for my hubby and I! 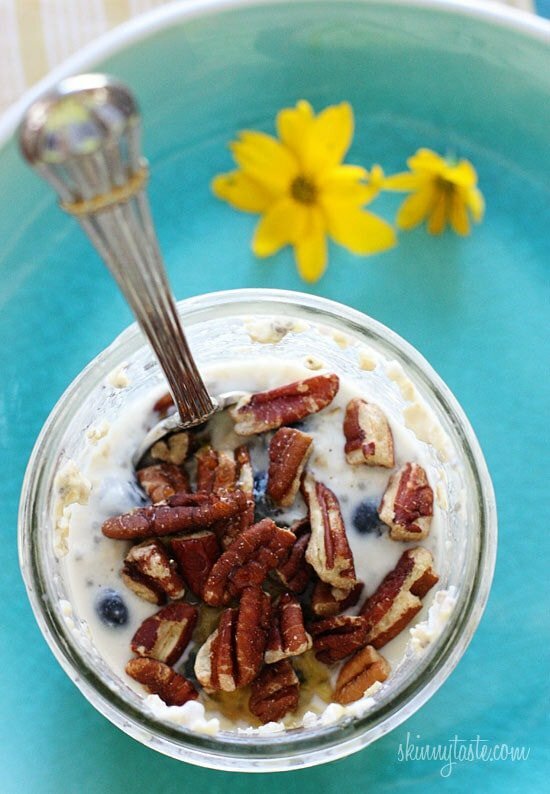 I switch up the recipe from time to time and use pecans, walnuts, coconut and vanilla extract! So have we resolved point count? Hi GINA. Why do we need to use jars? Can’t I make these in plastic containers? Thanks for the recipe! I also don’t do yogurt as the base for my overnight oats (lactose intolerant) – but mashing up a banana into the oats gets the same kind of creamy yogurt texture and some great flavor. Try it out! Made this over the weekend for company, one of which was vegan. They all loved it! Thanks Gina! I love this recipe but am looking for a way to add more protein, any suggestions? I make mine with 1/2 cup oats, 1 scoop of protein powder, one cup of almond milk and then whatever fruit/flavors I want like cocoa, strawberries, bananas, etc. With the protein powder I use, they aren’t grainy or chalky, you can’t even tell there’s protein powder in there! It gives me an extra 18 grams. What type of protein powder do you use? I use 1/3 cup oats, 1/3 cup almond milk and 1/3 cup 0% or 2% Greek yogurt and half cup berries. 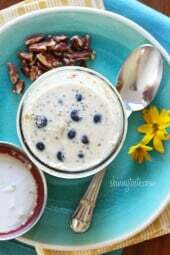 This gives it a nice protein boost and the Greek yogurt is great for lowering cholesterol along with the oats. Use cow’s milk instead of almond milk, make it 0% fat and you will have no grams of fat, add a dollop of yogurt, and if you also want to do your eyes a favor boil some eggs and have a hard-boiled egg as well. The yolk in eggs is the vitamin bullet that is packed with all those vitamins that protect our eyes from macular degeneration such as Lutein and Zeaxanthin. Almond milk has almost no protein and minimal calcium. If you need to use plant foods then go for soy milk which has much higher levels of protein. I made this and it was really good. Will make it again! I made it without nuts and came up with 3 fsp. What could be used in place of blueberries? It’s great made with strawberries! Can you eliminate the banana and use more blueberries? 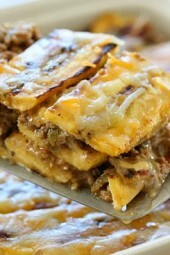 Love this recipe, it is especially great for meal planning. I usually make up 4-6 of these for the week (for my husband & I to share). I’ve substituted frozen cherries for the blueberries, and it is very good. I was hoping to see that someone meal prepped these! Good to know they will last a few days in the fridge. Thanks! Have you tried overnight oats with rolled Rye instead of oats? They sell it at Whole Foods in the bulk area. Really delicious! That sounds delicious! I will have to look for the Rye! How long will these last as a meal prep? I do something similar every morning, I use half of a banana, rolled Oats, almonds, sunflower seeds, unsweetened vanilla milk, cranberries and walnuts. Can I use regular skim milk instead of the almond milk? I live in the dairy state. Have to keep our dairy farmers happy. ???? Loved it! 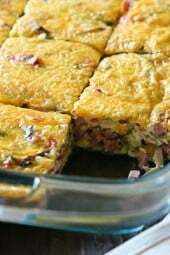 Nice consistency, full of flavor, easy to make! I bought quick cook steel cut oats??? I heard steel cut healthier. I threw together 4 last night with things I had in the house I only had to go find the Chia seeds at the store. I did substitute Splenda and used mixed fruit I had in the freezer, that I chopped up also nuked my chopped banana for 30 seconds because it wasn’t even close to being ripe… I did put them together individually into a large mason jar so I can give it a good shake. Then dumped it into two smaller jars I had. Then doubled it and left it in the large mason jar. We ate it this morning it is fantastic can’t wait to try it with peanut butter or cocoa or maybe even fresh cantaloupe. As a teacher on the go (with little time to stop and eat), this has quickly become my FAVORITE breakfast! I eat it alongside my class at their morning snack time and it is absolutely delicious. BTW, I don’t usually care for oatmeal, but this gem of a recipe makes it not only palatable, but something that I have come to crave…a MUST try recipe! Is this 5 points with the new flex points? Is this still 5 points? Made this yesterday for this morning and it was delicious, already made again for tomorrow morning! How many jars could I make at one time? Do they last a while in the fridge? Thanks! 3 or 4 would be ok! I didn’t raven notice until I’d made this a few times that your recipe calls for quick oats. I’ve been making it with regular rolled oats with great success. I add a little dribble of vanilla and a drizzle of real maple syrup as the sweetener. Love this and so does my hubby. Do you recommend frozen or fresh blueberries? I usually use fresh but frozen will work. Could you use steel cut oats? I did and it works just fine. Great recipe! This was very tasty! Thank you! Which Nunaturals stevia drops do you use? Does the bottle say alcohol free? Could you microwave these to warm them up? I can’t stand cold oatmeal, but would love the convenience and health benefits of non-processed oatmeal in the morning! When I put the info into Recipe builder, it says for a serving it’s 8 Smartpoints, which is correct? Nancy, would you send me a screen shot please? I was going to ask the same question?? Walmart brand quick oats are 2 for 1/4 cup dry. 1/2 cup unsweetened almond milk is 0. 1/2 TBS chia seeds is 1. So to me it is only 3… because I didn’t use any nuts in mine. 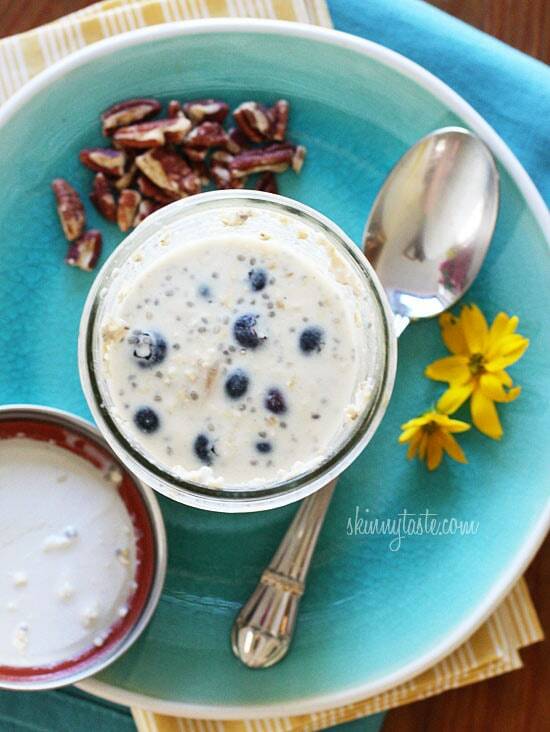 Are you using steel cut oats? I know they are 4pts for 1/4 cup, but regular quick oats are 2 pts for 1/4 cup. I hope that helps! Are the oats still good if you make them in advanced by two days, or does it need to be the night before? I make mine Sunday night for the week by putting all the dry ingredients together. Each night I add my fruit and almond milk. I’ve made several days worth of overnight oats (maybe three or four at a time) compete with liquids and other we ingredients and had no issues with them. I did a pint – worked well.